There are Currently No Northbridge Hotels Available. Click Here to view a list of Northbridge Apartments Available. Located at the western end of the Perth CBD the Four Points By Sheraton Perth is within easy reach of everything Perth has to offer. A short stroll will lead you into the heart of the city, with its vibrant malls, shopping areas and to the Central and Western Business Districts. It is close to Northbridge with its exciting nightlife boasting restaurants and enterntainment and just a few minutes drive from magnificent Kings Park. There is easy access to the rail and bus terminals and the excellent freeway access makes the Hotel a great place to base yourself whether your stay is business or leisure. The Four Points By Sheraton Perth offers spacious, comfortable rooms that will impress the most seasoned traveller and facilities you would expect from Perth's best value hotels. Why not dine in the Sheraton's fabulous restaurant, enjoy a drink in the relaxed atmosphere of our bar, have a swim in the heated rooftop pool or work out in the newly equipped gymnasium. The art-deco façade and some parts of its interior are being preserved as part of the Heritage Conservation effort to enhance the old style ambience of the area surrounding Hay Street. The rooms, lobby and its restaurants have been designed to incorporate the style of yesteryear with contemporary furnishing and design. Heritage-listed boutique hotel ideally located in the heart of the prestigious West End of Perth offering a relaxing destination for a romantic weekend getaway, night on the town or is an ideal choice for both business and leisure travellers alike. The Melbourne hotel offers 34 beautifully appointed guest rooms decorated in a traditional style with a personal touch of individual styling to selected rooms. Each room boasts old world charm with casual elegant furnishings. All rooms are warm, welcoming and stylish. This majestic Perth landmark, featuring stunning and ornate elements of a fine architectural era has been restored to return ‘The Melbourne Hotel’ to its former glory. Perth Ambassador Hotel is the ideal place for corporate and leisure traveller looking for great value for money. The Perth Ambassador Hotel is a 3.5 star hotel, prominently located on Adelaide Terrace, Perth. The location is ideal, within minutes from the Airport, close to the Perth business, shopping and entertainment districts, an easy walk to the Perth Convention Centre, and only a short drive to Burswood Casino, Swan Valley Wineries, and Perth Coastal Regions. The Perth Ambassador Hotel is your best Western Australia accommodation choice. The Perth Ambassador Hotel unveiled the first stage of an extensive refurbishment to its top four floors in March 2008. The facelift has placed the property as the leading 3.5 star hotel in Perth CBD, while maintaining a core philosophy of offering exceptional value for money and service. Located close to the major attractions of Perth, such as the magnificent Swan River, beautiful Kings Park and the majestic Swan Bell Tower, the Perth Ambassador Hotel is the perfect base from which to explore all that Western Australia's capital has to offer. The Perth Ambassador Hotel is a non smoking hotel offering 170 well appointed rooms ranging from Standard, Deluxe and Corporate Rooms to Executive Suites. The Perth Ambassador Hotel has a room to suit your Western Australia accommodation needs. The comfortable guest accommodation rooms are all equipped with spacious bathrooms including separate baths and showers, colour televisions with both free to air and cable TV channels , air conditioning, heating, iron and ironing board fridge, tea and coffee making facilities. Unique to the market place, the Perth Ambassador Hotel offers all guests FREE Broadband Internet Access, making the property ideal for business and leisure travellers alike. The Perth Ambassador Western Australia accommodation offers 24 hour reception, catering to guest's needs any time of the day or night. This area also acts as an information/tour booking desk allowing guests to make tour reservations directly from the hotel. Other facilities at the front reception include safety deposit boxes and foreign currency exchange. Enhancing the experience for corporate guests is a mini business centre located in the lobby. Perth Ambassador Hotel offers an in-house, self service, coin operated laundry available for in-house guests. Alternatively a dry-cleaning / laundry service available. Cafe 196 is located on the ground floor and offers buffet breakfast and a la carte dinner service 7 days. The restaurant offers friendly and attentive service with a menu offering a blend of both Asian and Australian influences, showcasing both cooking styles, diversity of flavours, colours and textures. The menu is complimented with a selection of local and national boutique beers and wines. Food to Go is a takeaway food and beverage service and is available during restaurant opening times. The Lounge Bar is the ideal setting to enjoy a pre dinner drink with friends or business associates. A new addition is the photography by local WA Artist Deborah Greenacre, each individual piece is framed and is available for purchase, making it a fantastic gift for friends, family or a special way to remember your stay in Western Australia. Relax and unwind after a hectic day in the Spa & Sauna, which is located on the 5th floor. Hotel guests are welcome to pamper themselves at Salon Antics Day Spa located across the road at the Goodearth Hotel. Further facilities include on-site car parking facilities, conference and meeting facilities for 2 to 80 people, air conditioning, car rental facilities, copy service, airport shuttle, vending machines, lift/elevator and post/parcel service. The Perth Ambassador Hotel invites you to experience the difference. Rydges Perth is one of the CBD's premier 4.5 star hotels, offering contemporary decor combined with modern comforts, services and facilities. Rydges Perth features 245 well appointed spacious guestrooms; which include stylish decor and large floor to ceiling windows, including our premier spa suites with river views and state of the art Executive Club floor rooms which have exclusive access to our Executive Lounge designed specifically for the corporate traveller. Rydges Perth combines the best of both worlds; located adjacent to the West End entertainment district and CBD business district, the central location makes it an ideal choice for both corporate and leisure travellers. The hotel is simply 20 minutes away from the airport and a 5 minute stroll to the train station, with the main shopping strip a mere 2 minute walk away and King St the designer shopping strip just across the road. The award wining alfresco style CBD Restaurant&Bar is located on the ground floor of the hotel, which combines the best of modern city dining and ambience. Facilities include 24 hour Room Service and Reception Desk, Concierge, Valet Parking, Fully equipped Business Centre, Non Smoking rooms only, modem points in each room and a fully equipped Conference and Events floor. Pensione Hotel Perth is a three and a half star city hotel that has a range of modern facilities and provides friendly 5 star customer service. This quality Perth hotel is conveniently located in the heart of the city centre and is close to all the shopping malls, city attractions and the free central area transit (CAT) bus system. The guest facilities at Pensione Perth Hotel include a restaurant, bar/lounge area, guest laundry, business centre, internet access and tour desk. The Pensione Hotel Perth provides the perfect location whether your visit to Perth is for business or pleasure. Treat yourself to unparalleled convenience and comfort at Citadines St Georges Terrace, located in the heart business district in Perth. These residences are ideal for the international business trip and leisure vacation as each contemporary residence is designed with space, light and modern features for both living and working comfort. You can experience the vibrant city of Perth from an inner city retreat with business facilities as well as extensive recreational facilities and resident's programmes. Just outside the residence are restaurants, entertainment, art and cultural destinations, parks and the scenic Swan River. Discover Perth while living in the security and comfort of a private serviced residence with personalised services and facilities. Offering 84 contemporary rooms, which range from spacious studios, spa studios and one-bedroom residences, you can enjoy stylish city living at a prime downtown address. Doing business is easy with our business support services, large well lit work areas, telephones with speaker and IDD facilities, and broadband internet access. The conference / function room facilities are also available for work or pleasure. After work, relax in the café or by the al fresco bar located on the ground floor -- just the work-life balance suited to the busy executive on business or leisure traveller looking for a weekend getaway. Quality Resort Sorrento Beach is the closest accommodation to the beach in WA. With uninterrupted Indian Ocean views and the best location in Perth, adjacent to Hillarys Boat Harbour and AQWA (the Aquarium of WA), this fantastic four star accommodation property is exactly 76 steps to the pristine white sandy beach and the water's edge. The the 80 room Sorrento Beach Resort on Perth's fabulous Sunset Coast boasts a wide variety of room types as well as an outdoor swimming pool, spa and barbecue area overlooking the beach. There is also a licensed restaurant and bar, conference facilities and all the services provided by the famous Sorrento Quay that make us the ideal place to stay. The Indian Ocean Hotel provides a range of 3.5 star hotel rooms and suites, all with air-conditioning, direct dial telephones, tea/coffee making facilities, colour TV with 2 free movie channels and ensuite bathrooms with hairdryers. Our Reception is open 24 hours a day for guest convenience, and our staff will happily assist with tour bookings, shuttle services, local timetables to most events and general guest queries. Enjoy a meal and/or beverage in our 'Indi Bar & Bistro' with live entertainment from Thursday to Sunday. Grab a snack poolside, or relax in the privacy of your own room and order in room service. BBQ facilities are also available for guest use. Our Games Room provides a pool table and variety of video games for kids of all ages, and our pool and spa areas are open until 11pm daily. Internet access is available from our Wireless Internet "HotSpot" in the Bistro/Bar, outside pool area and standard and deluxe rooms. This service is free of charge and available 24 hours a day. Wireless network cards are available for loan during your stay if your laptop computer requires one. A coin operated DSL Internet Kiosk is also available for guest usage at $2.00 per minute. Located just 300 metres from Scarborough Beach, come and stay at the Indian Ocean Hotel when next visiting the West! Welcome to theSundowner Ocean View Motel in Perth, Western Australia. This semi self-contained accommodation in Perth is located on the spectacular and peaceful Sunset Coast, only 70 metres from the breathtaking beaches, 4 kms from Hillarys Boat Harbour, 50 metres to public transport and only 15km from Perth CBD. Guests at the Sundowner Ocean View Hotel can relax on their balcony and enjoy the magnificent Indian Ocean views, visit wineries, swim with wild dolphins, watch the whales, take a trip to Rottnest Island or explore the exciting port city of Fremantle. The Sundowner Ocean View Motel offers a great location, a comfortable quiet and clean environment to relax in, friendly service and great value for your holiday dollar. Ocean View Rooms, Family rooms, SPA room, BBQ area, Sun lounge area with ocean views, Laundry, DVD, Internet (W-LAN or dial-up). Walking distance to cafés, restaurants, deli, and shopping centre. Perth is an ideal base from which you can explore the fantastic surrounding attractions. So for that well earned break, your hosts, Ulli & Fredy Zicher will welcome you to Sundowner Ocean View Motel. Rendezvous Grand Hotel is Perth's most iconic beachfront hotel. located right on the beach, overlooking the soft white Scarborough Beach sand and sparkling blue of the Indian Ocean. 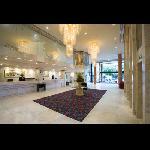 Rendezvous Grand Hotel is Perth's only four star resort located right on the beach. A short palm-lined drive leads to the entrance of the Rendezvous Hotel Scarborough. Inside lies a two-storey atrium lobby with glass ceiling. Guests can relax on sofas scattered in front of a cascading water feature with potted palms. The reception lies to the right of the entrance, and is hung with artworks. Rendezvous Hotel offers luxurious guestrooms and suites with panoramic ocean views and private balconies that are overlooking the magnificent Indian Ocean or surrounding suburbs. All guest accommodation is spacious and well equipped, decorated in contemporary style with medium-grain wood furnishings, a white and slate-blue decor, and abstract artworks. All feature modern amenities to make your stay comfortable, including air conditioning, private ensuite bathrooms, sofas or armchairs with side tables, cable TV with premium channels including Foxtel, Discovery, Nickelodeon, Sky News, and Fox Sports, sitting areas, mini bars, refrigerators, desks with direct-dial phones, lamps, high-speed Internet access and modem/data port connections, minibars, toasters, tea/coffee making facilities, ironing boards, hair dryers, telephones, voice mail and complimentary newspapers. For recreation, The Rendezvous Hotel offers a heated, outdoor lagoon-style pool with adjacent spa and kid's wading pool. There are also two floodlit tennis courts and a fully equipped fitness centre. The Vanilla Face & Body Spa encompasses two floors and comprises eight treatment rooms, including a Vichy shower room and a rainshower room, providing a full range of health spa treatments. Also on site are four dining venues. For dining, the Rendezvous Hotel offers the Pines Buffet Restaurant which features floor-to-ceiling windows with magnificent ocean views. The restaurant is open daily for breakfast, lunch, and dinner, providing international buffets including seafood, carvery, salads, and desserts. The Stamford Arms Pub is open daily from noon until late - a British-style pub with outdoor terrace overlooking the ocean and a big screen showing live sporting events. The pub offers hot and cold bar snacks, British and other imported beers, cocktails, and soft drinks. The location of the Rendezvous Hotel is absolutely ideal for accommodation in Scarborough close to the white-sand surfing beach with its numerous water sporting opportunities, only a few blocks from shops and restaurants, and only 12 kms northwest of the Perth city centre, with easy access to the Port City of Fremantle, Aqwa Marine Park, Hillarys Boat Harbour, Rottnest Island, Swan Valley, popular shopping destinations and championship golf courses. Whether for business or for pleasure, make your next stay in Perth a rendezvous with the very soul of Western Australia - the white sandy beaches and cool blue waters of the Indian Ocean. A rendezvous with exceptional luxury, style and service - exclusively at Rendezvous Hotel Perth, on the Sunset Coast in Western Australia.